Are you looking to rattle your car and get the other cars on the street pumping as well? We’ve got you covered with our competition subwoofer buying guide. Competition subwoofers are heavier duty products than standard subwoofers and put out a higher frequency with more intense bases. You can install them on their own or in a set to increase your stereo power. Before we get started, let’s look at some things you should know. Size: Size correlates directly to power, but also where it might fit in your car. 18” competition subwoofers are going to have deeper lows than 8” woofers, but you need to assess your car for space before purchasing. Pieces: This is how many woofers and associated pieces come with the product. For the most part, all the products here are a single woofer only, and any additional parts you have to purchase separately from each other. Max Power: This is the maximum projected power than the subwoofer could potentially reach, measured in watts. Basically, it tells you how much it’s going to vibrate on some of those base lows for maximum shaking potential. Dual 0hm: The 0hm level of a subwoofer has a lot to do with how you’re doing to be wiring it into your system, and what you’ll be using it for. You’ll have the ability to wire for different powers and performance. Foam Surround: The surround of the subwoofer is an insulation so that the vibrating parts don’t get hurt or injured while the woofer is working. Foam is gentler and will absorb more impact than rubber or other materials. Warranty: A warranty is made to protect you and the things you’re purchasing from manufacturing defects. If it stops working during the time frame, you might be eligible for a return or refund of your money. Now we can jump right into the competition subwoofer reviews! Here you’ll find a ton of jumping, bumping, powerful devices to give your music new life. If you’re in a hurry, check out our top pick and budget pick, but remember to browse the rest of our list for mid-range prices and excellent quality subwoofers. Now get your bounce on and turn up the bass. We’re going to get started. Our choice for one of the best competition subwoofers for sale is this HCCA Series woofer from Orion. The people at Orion certainly know what they’re doing when it comes to audio – this thing is a beast and will have your bass bouncing at unreal levels. It’ll even vibrate the road beneath your tires. The Dual 2-ohm voice coil is durable and sweet, and it’s surrounded not with foam but with a high-quality rubber. The cone inside in an injection-molded polypropylene, so it’s going to last you a long time. It’s a loud woofer that can produce extremely loud sound, so of course be cautious while using it. It weighs a ton but the bass system in your vehicle will never be the same without it! It’s a 10-inch subwoofer that will fit perfectly in any size car because it produces quality sound without taking up much space in the trunk. We know you’re going to love its bump! Next up is one of the best cheap competition subwoofers on our list. 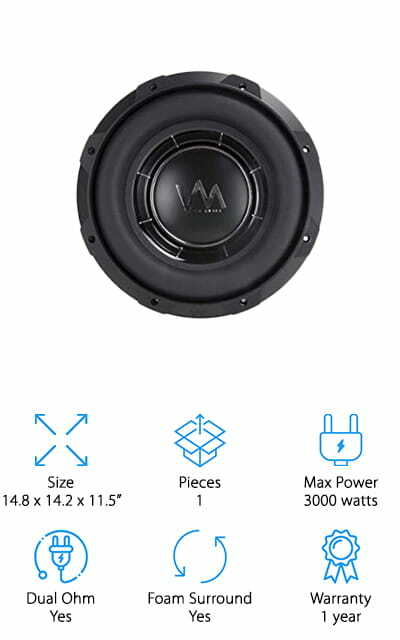 This also happens to be a great competition 12” subwoofer, because it puts out an amazingly deep bass and clear, loud sound even at just twelve inches. The great price is also definitely a bonus! It comes with dual 4-ohm coils that help it work well in a dual-woofer setup, which is something that you can explore if you find that this one subwoofer isn’t doing the job you want. 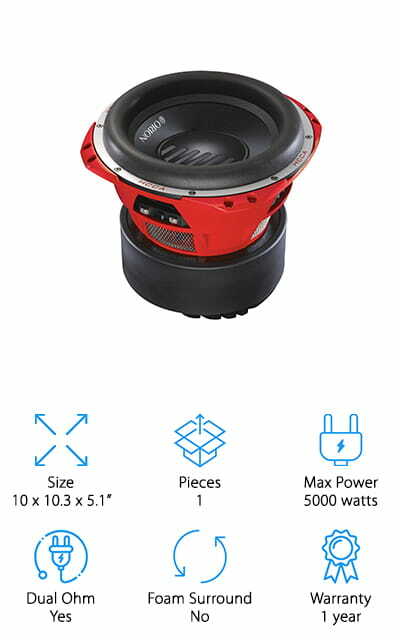 The peak capacity is 1400 watts, which is pretty amazing for a small woofer. In addition, it’s sensitive to 95dB, which means that it’s going to get loud quickly and make your whole car bump with it. We love the bass that comes out of this thing, and we think it will work well as a dual setup woofer. 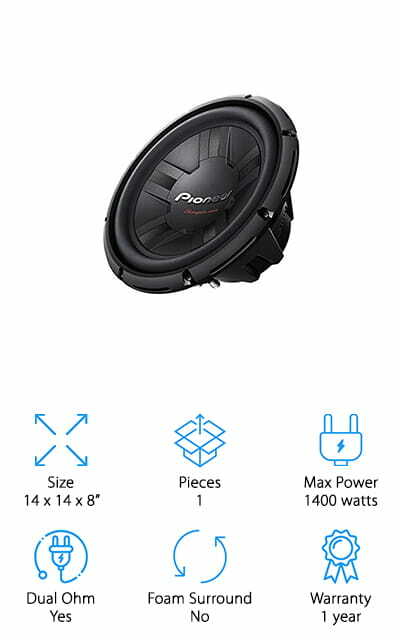 Pioneer is one of the best competition subwoofer brands, and this product shows it! 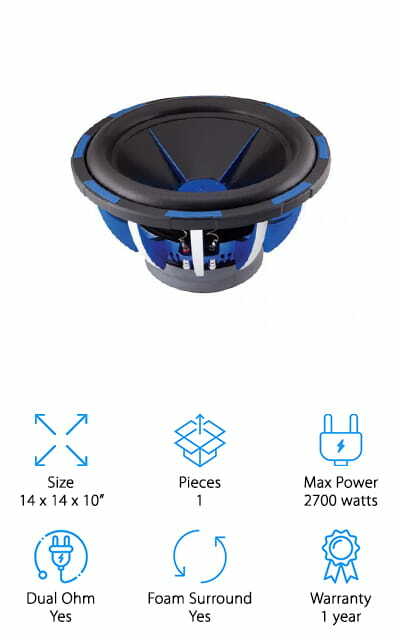 One of the greatest competition 12-inch subwoofers is this model by Power Acoustik. It’s powerful enough that it heats up quickly, which means it’s a pretty good idea that it’s surrounded by UV coated foam to help keep it insulated. It also comes with a built-in 4-spline heatsink and dual-cone spiders, so set up should be a breeze. This thing can give you clear, quality sound that you’re going to love to listen to, and it handles all of the lows with ease and grace. There are dust caps to help heat dissipate, and you’re going to want to put it in a larger box to help with that. We love that this thing is 12 inches, yet it delivers so much power and bump that the cars next to you are going to be able to feel it up through the seats. The dual voice coils also work to give it a great sound! 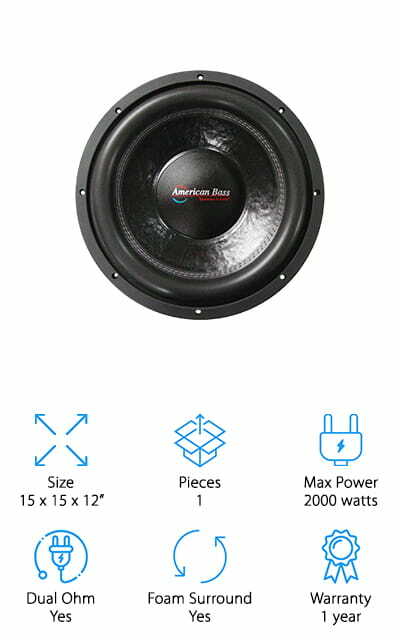 This dual 4-Ohm woofer by American Bass has a lot of power packed into a small package! The cone inside the woofer is made of carbon-Kevlar paper, which means that the sound is going to be deep and it’s going to get low without sacrificing the quality of the sound. It’s got its own high-tech cooling system to prevent it from overheating and damaging itself. This thing is a beast, and it’s pretty well-reinforced all the way around. What we love most about this woofer is the affordable price. You get a lot of power and sound quality in a tiny package that isn’t as expensive as some high-quality subwoofers that are smaller. It is a great addition to your setup, and when connected to the right amp, packs a punch like you wouldn’t believe! Use them in a dual setup to get all the cars on the street bumping to your favorite bass-heavy beats. This is one of many competition grade subwoofers that actually delivers on what it promises. This thing is quite the powerhouse, as it has an 85dB sensitivity and packs a specific high-temperature aluminum voice coil that you won’t have to worry about overheating no matter how sick the beats get. It will withstand most of the abuse that you can throw at it when paired with an applicable amp. We love that the company has put so much thought into the creation of this woofer and carefully evaluated the pros and cons of each feature that they add. The foam that surrounds the subwoofer is made with nylon stitching to help reinforce the bump on this powerful little beast. It’s one of the best competition car subwoofers that we could find because of the small size and amazing power and sensitivity. Two of these will pump your bass up to the next level with the correct setup! One of the top competition subwoofers comes in this small package: a 12-inch woofer by DS18. This particular model is so loud it’s going to blow you away. It’s got a glass fiber cone with foam edging so that it’s properly insulated and won’t damage itself when it’s bumping away. The basket is aluminum and adds a nice touch that also helps vent away from the heat that it creates. The 2000 watt max power means that this woofer is going to be powerful, and create a clear sound without any additional wattage muddying it. The coil has four layers and is powerful aluminum, and it also comes equipped with a double magnet and a 2-layer spider that’s going to be durable and absolutely crucial to your setup. The 88dB sensitivity is going to blast you out of the car with the volume! This thing is loud and in charge, with a mid-range price and a tiny frame. This subwoofer is unique on our list for only being an 8-inch woofer rather than a 12 or more. That means that it’s small enough to fit even in the trunk of a compact car – and you can double it up to get the most out of your system. It won’t be as loud as some of the others on our list, but the price and the performance considering that price makes it more than worth it. The voice coil is super high quality, and it tosses out such high-quality audio that you won’t even mind that the bass isn’t as deep. But that isn’t to say that it doesn’t bump – this thing can still rock your car if installed right! We love the insulated surround that allows it to function without damage, and we love that there is so much quality packed into this tiny package. You should definitely try it if you’re just starting out. This is a simple little subwoofer that can still kick up the volume and hold its own with competition 15” subwoofers without breaking a sweat. It’s surrounded by a thick layer of 1.5” foam that is dense enough to protect it while it’s working. It’s affordable and powerful, and you might as well get two to make your car really shake. The spider design, meaning the part where it connects electrically, is durable and high-yield so you won’t have to worry about replacing them anytime soon. The bass is lower than you might expect from a woofer this size and still big enough to get a decent rattle on your car windows. It’s optimized for the best performance and made with low carbon steel to be light to haul around. The dual Ohm voice coils will produce a heavy sound that you’re going to love. If you’re looking for something simple but still potent, check this woofer out! Skar Audio is a really well-known name in the subwoofer industry, and this product definitely meets the expectations set down by the brand. Even the best 15-inch competition subwoofer would have issues keeping up with this 12-inch one, with a high-temperature copper coil thigh-quality sound whe7n installed correctly. The spider has four different layers so that it’s durable and the connections will hold on. The 83 dB sensitivity will make sure that your music is heard loud and clear! We love all the different features packed into this woofer. It’s a great quality piece, and the price is definitely a product of a lot of thought and high-quality engineering. The price is well worth the quality that you’re getting, and a woofer that’s going to last you a long time and even bump up the other cars on your street! Everything about this subwoofer is pretty amazing and we’re sure you’ll love it! This subwoofer is unique on our list of the best because while it has Dual Ohm capabilities, you can also wire it for single Ohm if that’s more what you’re after. The versatility gets this product by VM audio into our list without a second thought. Due to the unique mechanical suspension and other features, you get such a pure, clean sound when using this subwoofer with a deep bass that you’re absolutely going to love. For a 12-inch subwoofer to put out 3000 watts at max power has to mean that it’s a beast. The bass is going to be incredibly low and deep with this woofer, and we wouldn’t have it any other way! The basket is a die-cast aluminum that provides it the proper amount of structural integrity. What more could you want from an amazing subwoofer but sound, bass, and durability! This one has all of that and more for perfect performance.